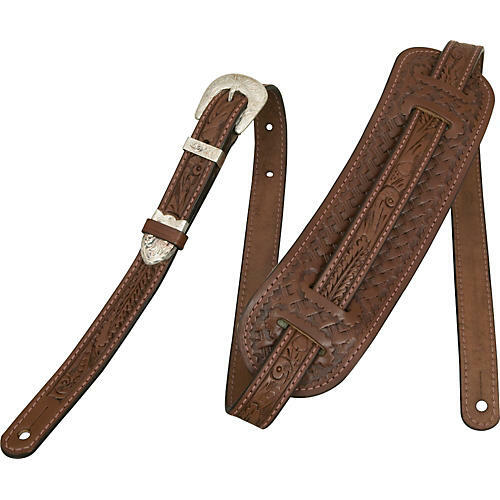 The Vintage El Dorado Leather Guitar Strap is meticulously hand-tooled in traditional Western motifs by leather artisans with decades of experience. Each strap is an individual and unique work of craftsmanship that you'll be proud to display on your guitar. The designs date back to late 19th century Western leatherwork, used extensively in the decoration of saddles, saddlebags, belts and holsters. Shoulderpads are tooled in traditional "Basketweave" pattern, backed with genuine sheepskin shearling. Buckle, loop, & tip are crafted in solid nickel-silver, hand-engraved, finished in sterling. Call or click today to order!